NOTE: For each image, click "Discussion" for a pop-up window with background information. To print the pop-up, hit Ctrl and P on your keyboard. Many factors conditioned the ways Europeans responded to Native Americans and the ways Native Americans responded to Europeans. Motivations, expectations, political and social structures, religious beliefs, concepts of civilization, and perceptions of wealth and power all played a role. Perhaps nowhere is the complex mingling of such forces more evident than in Hernan Cortés's encounter with the Mexica (Aztecs). Cortés landed at what is now Veracruz in Mexico on Good Friday, April 22, 1519. He set sail from the flourishing Spanish colony of Cuba. His troops included many men who had arrived on the island too late to grab their own estates. Thus when they came to Mexico, their greed was alloyed with a desperate resolve to capitalize upon a second shot at riches. To illustrate their mindset, we offer the "Requerimiento," a proclamation in which the Spanish spelled out, quite bluntly, the deal they had in mind for the natives of the Americas: Convert to Christianity or be attacked. The traditional story of the Aztec relationship with the Spanish, rooted in the Spanish perspective, describes how a "handful" of soldiers overwhelmed the Aztecs and wiped out their civilization. Much of that story comes from a series of letters Cortés sent to his royal sponsor King Charles I, and here we read an excerpt from his second letter, in which he expresses his awe at the Aztec capital of Tenochtitlán (modern Mexico City). For over four hundred years the Indians' accounts of Mexico's conquest were not easily accessible, but in 1959 Mexican anthropologist Miguel Léon-Portilla published Visión de los Vencidos (Vision of the Vanquished, published in English as The Broken Spears). It weaves together selections from a variety of sixteenth-century indigenous accounts, some as early as 1528, into a narrative that describes among other things, Cortés's landing, the battles he fought and alliances he made on his march to Tenochtitlán, the Aztecs' defensive maneuvers, their almost successful retaliation, and finally their fall. An engaging read translated from Nahuatl, the language of the Aztecs, it reveals a world of omens, splendor, intrigue, diplomacy, and treachery (included also in #6:INDIANS' ACCOUNTS). Not only did Indians recount the cruelty of the Spanish conquest, so did a Spanish priest in Mexico, Bartolomé de las Casas. 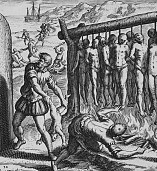 A human rights activist in today's terms, he compiled his eyewitness accounts of Spanish atrocities with others' from across the Caribbean and Central America, and presented them in 1542 to the Spanish king, imploring him to "extirpate the causes of so many evils." The king responded as las Casas hoped, issuing "New Laws" to moderate the treatment of the Indians, but they saw little enforcement in the New World. Las Casas titled his compilation A Short Account of the Destruction of the Indies; we present his introductory and concluding statements here, which you will find sufficient to absorb his horror and moral anguish. Compare the Native American culture the Spanish encountered in Mexico, as described in Cortés's letter and the Indian accounts, with the cultures encountered by the English, the French, and the Russians in their explorations. How does Cortés's letter reflect the spirit of the "Requerimiento"? How did the culture of the Aztec's shape the Spanish response to it? How do the details Cortés chooses to describe in his letter reflect the motivations, intentions, and expectations of the Spanish in Mexico? Compare Cortés's description of Tenochtitlán with its appearance in the Aztec description. Compare the tone and the circumstances of the first encounter between the Spanish and the Aztecs with the tone and circumstances of the first encounters described by other explorers in this section of the toolbox. What accounts for the differences? What general pattern of Spanish conquest does las Casas present in A Brief Account? How does it compare with the Indians' accounts? How did las Casas structure his report to most influence the king's response? The Aztec acrobats who performed for King Charles were probably the first Native Americans their audience had ever seen. What impression does Weiditz's painting convey? What would the painting tell its European viewers about Native Americans and about themselves? The feather painting scenes were done nearly fifty years after the painting of the juggler. How has the image of the Native American changed? What were the Franciscans saying about the Indians and about their fellow Europeans? How does the painting depicting the burning of the idols both reject and affirm the Aztec heritage?  How did Europeans interpret the "newe fonde londe" upon their first contacts?  How did Indians respond to the Europeans?  How did these initial encounters frame future Indian-European relationships?  What did the "New World" signify to Europe in 1500? in 1550? Image: Theodore de Bry, engraving in Bartolomé de las Casas, A Short Account of the Destruction of the Indies, written 1542, orig. publ. 1552, engraving from de Bry 1598 publication. Reproduced by permission of the John Carter Brown Library, Brown University, #0683-2. Copyright © 2006 National Humanities Center. All rights reserved.